Don't Take Out The Trash, Live With It! How far would you go to demonstrate your concern for the environment? 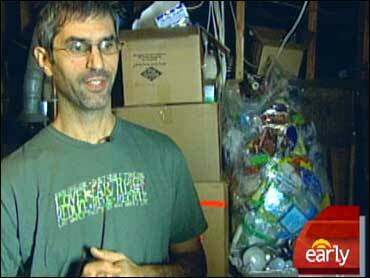 One California man is so concerned about how much garbage we generate that he's decided to live with it ... literally. "All right, so, here's the basement. Um, obviously, all the bottles, don't hit the top one 'cause it dominoes down, it gets a little ugly," Dave Chameides tells Early Show national correspondent Hattie Kauffman. Since January, Chameides has saved all of his trash in his basement. "Pretty much every time someone hears that I'm saving all my garbage in the basement for a year, the first question is 'You're crazy, right?'" Chameides says. It's an eco-experiment to see how little garbage one person can produce in a year. "When you look at all these bottles you'd think, 'I'm just not gonna have that beer tonight,'" Kauffman says. "No, not really, I mean I thought about going with a keg because I thought that would take care of the bottles, but I'm sticking with the bottles for now," Chameides says. From empty boxes to broken bulbs, everything is saved and sorted. "This is the bag of bags, 10 months," Chameides says. "Potato chips, soy nuts …," Kauffman notes. Food scraps go first to his dog, then to the pet rats. Other leftovers are consumed by his worms. "They eat the paper too. They turn this into really good fertilizer," Chameides says. "And you cover it up and goodnight." And because of the worms, the basement doesn't stink. "There have been times when I've had four months worth of food in there," Chameides says. "It smells like dirt." EPA studies indicate the average American generates about 1,600 pounds of trash per year -- more than half goes to a landfill. "I don't care where you are politically or environmentally, that's just stupid," Chameides says. "We've all been taught to bring your own bag," Kauffman says. "You're saying bring your own container." "Bring your own container, exactly," Chameides says. "If I bring this, then they don't have to give me the wrapping. I can take it home, marinate it in this." When his experiment ends on Dec. 31, his trash won't be headed for a dump. His garbage is going on permanent display at the Museum of Trash in Connecticut, inspiring others to talk trash. "Right now, grab a piece of paper and a pen, write down everything you're going to throw away for the next week and look at it. Fifty percent of it you can get around. So should you keep all your trash in the basement? Well ask my wife about that one," Chameides says with a smile. Chameides will have a book out next month called "365 Days of Solutions." It'll be filled with all sorts of ways to reduce your garbage. If you're interested in finding out more, you can go to his Web site 365daysoftrash.com.